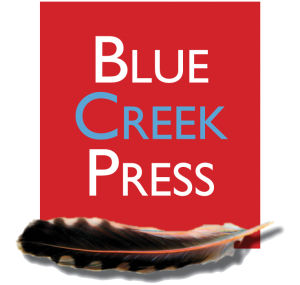 Blue Creek Press edits, designs, and publishes proprietary and subsidy books, as well as collateral and advertising materials for business and non-profit organizations, including Montana Wilderness Association, Idaho Conservation League and Friends of Scotchman Peaks Wilderness. We are specialists in production for on-demand books. We offer discounts to non-profits whose mission we believe in. Fun and financial independence through creative expression. Heron, Montana, (home to Blue Creek Press) is just to the south of the proposed Scotchman Peaks Wilderness. 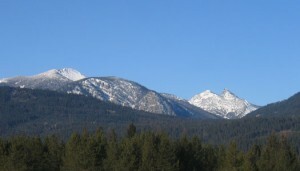 The jagged peak on the right is Sawtooth Mountain. The bulky mountain on the left is Clayton Peak. Earl and Mariam Clayton settled the land at the mouth of the Blue Creek Canyon in 1917, naming their holdings the Blue C Ranch. Their grandchildren and great grandchildren — the Compton branch of the family — have come to own “the Ranch,” and several still live there, including Sandy Compton, one of the area’s most respected writers. He has named his small publishing company “Blue Creek Press” in honor of the land he grew up on. Two great books. One great price.